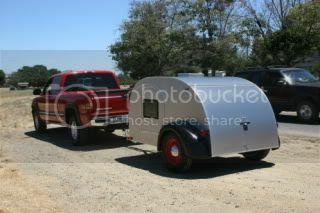 Teardrops n Tiny Travel Trailers • View topic - Smiles to go! Updated 8-2 new pics! First trip! Smiles to go! Updated 8-2 new pics! First trip! So, after lurking and the occasional post here, my build is officially underway. building a 5x8 benroy on a northern tool frame. just started making saw dust today. cut the 2x4s down to build the platform and will start to cut the profiles either friday or this weekend as time allows. Doing full insulation, 3/8" acx for the external walls, I have Baltic Birch 5x5 panels on order, doors have arrived, hurricane hinge and fantastic fan. Bought the $99 tongue box from northern tool as well. Building this with the kids too, so they can get a project to call their own. Last edited by booyah on Mon Aug 03, 2015 10:48 am, edited 8 times in total. Good luck on your build. 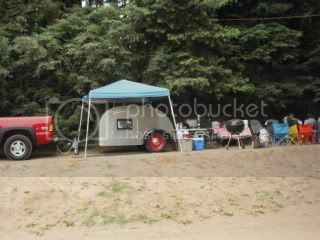 I built mine on a 5 x 8 Northern Tool trailer and it worked great. I did build mine 10 feet long. The extra space inside is really nice especially if your gonna have the gang along and it sounds like that the direction your heading. I look forward to seeing your build pics. My Dad Was with me every step of the way. The time I spent building the camper with him is priceless. There is no substitute for quality family time and sharing and teaching your children a skill that will last them a lifetime. Kids will be out of school soon and ready for this project. Not much for updates right now, been working too much, and kids have been sick. last night I re did the deck, when I screwed it all down, I forgot to glue. Measured for my carriage bolts, drilled the holes for those, cut insulation to go in the floor and got myself all prepped for doing the asphalt paint. Hope to get the first coat of the black beauty fence post paint on tonight, and its supposed to be clean and dry tonight. Maybe get the second coat on before the weekend then I can start to work on the profiles! Added rear stabilizer jacks, otherwise, waiting on the stupid rain to stop long enough to get a coat of paint on the bottom of the thing. Till then theres not much I can get done stupid weather! Two coats of black beauty fence paint on the bottom, insulation installed, and I am ready to flip the bottom over and work on the profiles! finally got the weather to work with me long enough. Hopefully tomorrow I will have pics of at least one side up! doors test fitted, so far so good! Working on fitting 1x2s all around the profile, doors, and anywhere else that I need the extra support. Plan is to have the walls insulated, and trim the inside layer so I can get em standing up before the end of this weekend! Hope to post pics tonight of the first profile cut and the 1x2s around the inside. Need to run the router over them again to match the profile, but this is the most progress I've made since I assembled the trailer. Getting excited! Had a friend over, so we placed the walls up. Have to build and place the bulkhead, wire, insulate and complete the walls but at least they are up! starting to look like something at least! Thoughts? it appears the hub is 5x114.3 which is as common as rice in China, so I should be able to source em from the junk yard pretty easy and cheap. Any one else swap out the wheels on a northern tool 5x8? Anything else fit under the stock fenders? Got a source on cheap fenders? Got a RPM calculator on how much slower the wheels will turn at say 55 and say 70? 5 x 4-1/2 is a very common trailer wheel pattern. Also common on many Jeeps (TJ's, Cherokees, YJ's), small Ford pattern (early V8 Mustangs), and early Mopar, among others. Just be sure to check back spacing and hub diameter. The rim size is not what matters. It is the size of the tire, or more accurately, the height of the spindle above the ground, which is determined by the tire, not the rim. * you can cheat and just use the tire circumference, either by measuring around the tread, or multiplying the advertised diameter x Pi (for Pi we can use 3.14). For a more accurate result use spindle height above ground x 2 x Pi. Spindle height is a more accurate representation of the effective tire radius. Be advised that the side wall size designation on your tires is usually only an approximation and can vary by a lot from the true rolling radius. The weight of the trailer affects this value due to the tread conforming to the ground, and manufacturers have been known to fudge the truth, especially in the off road tire industry. Last edited by KCStudly on Tue Jun 02, 2015 2:47 pm, edited 1 time in total. Quick question for people, I'm debating between doing just fiberglass tapes on the seams and epoxy over the entire tear then painting with brightsides paint, or doing a light fiberglass cloth (4 oz) and epoxy then brightsides. Great progress so far. Keep posting pics. My build was also a Ben Roy type on a NT 5x8 trailer. Thanks Tommy, I followed your build as you did it. Turned out very nice!